Looking for private in-home or in-studio Flute lessons? Our Sherman Oaks teachers are ready to get you started. Find your teacher today! Check out some of our most popular teachers near Sherman Oaks, CA including Los Angeles, Long Beach, Glendale, Burbank and Huntington Beach. After discussing your goals, we will figure out the best way to accomplish those goals! I am a really easy-going person and I want you to have FUN and discover new stuff every time you play your instrument. After we figure out what you want to play and what areas we want to work on, I will make a special curriculum for you! Each student has a different curriculum that is specific to his or her level and learning style. I give a weekly curriculum after every lesson so you don’t need to worry about forgetting what we worked on at our lesson and you can work on it at home. Looking at past curriculum also provides an excellent way to look at a student’s progress. I have been playing saxophone for 18 years and currently I am playing professionally in the Los Angeles area. I have been teaching music for more than 8 years and have been able to find fun and creative methods for helping my students succeed. I was born and raised in Tokyo, Japan and surrounded by a musical family. I started playing piano at age 4 and started playing saxophone at age 10. I continued my woodwind training in high school by learning to play flute and clarinet. After beginning saxophone, I found I had a passion for big band jazz music. I joined a big band for young musicians and played lead alto with the band for almost 6 years. on, I was fortunate to play lots of gigs around town and was also a featured soloist on a number of recitals, recordings, and film scores. In May 2010, I graduated from Berklee College of Music and moved to Los Angeles. Always maintaining a busy schedule, I have been performing with a number of talented musicians at several venues in the LA area. In addition to playing live shows, I have been recording for film/TV music. Thank you so much for stopping by my page and hope to work with you soon! Other topics that we might cover include sight-reading, improvisation, theory, ear training, etc. You are welcome to bring/suggest any music that you want to work on! My studio is in a safe and nice family friendly neighborhood as you can see in the photos. Natsuki is very patient and she really makes sure you understand what you're learning. Patient, knowledgeable and professional. Glad I found her. Learn how to properly move your air, to produce great tone in anything from classical to jazz. Kris has been a private vocal, flute and piano instructor since 1984, and has been teaching in the Santa Clarita Valley since 1994. Her students have gone on to perform in the Los Angeles Opera Company, and in Regional Theatre and National Touring Companies for Hairspray, The King And I, The Music Man, Jekyll and Hyde, A Little Night Music, Fiddler On the Roof, My Fair Lady, Edges, Cats, and many other great musicals. She has been an Individual Voice Instructor at The American Musical and Dramatic Academy in Los Angeles since the Fall semester of 2004, and also teaches at a private studio in West Hollywood. She has taught vocal workshops from coast to coast, in Musical Theatre and Rock styles. om and Footloose, and was also the Vocal and Musical Director for their production of Once Upon A Mattress. She was the Vocal Director for productions of Into The Woods and Urinetown at Hart High School in Newhall, California. She has also lent her talents to Benefit The Leukemia Foundation, Project AIDS L.A., and The Compton Battered Womenâs Shelter, as featured performer, Vocal and Musical Director. Kris has been a professional performer since the age of 10, beginning her career in the world of sacred music. She had the privilege of being a televised singer of sacred music, in the cathedrals of St. Patrick's and St. John the Divine in New York City. Kris' live performances have included all styles of music, including Jazz, Pop, Country, Bluegrass, Broadway, Classical, and Rock. She has had an extensive career as a jingle singer, arranger, songwriter, flautist and backup vocalist, as well as having had her own weekly broadcast jazz show. Kris has appeared in several musicals, on stage and in the orchestra pit. Musical Theatre credits include: Frau Blucher (Young Frankenstein); Mother Abbess (The Sound of Music); Mrs. Beauregarde/Grandma Josephine (Charlie and the Chocolate Factory); Philia (A Funny Thing Happened On the Way to the Forum). She has also sung in the Ensembles of several other productions. She led and performed with the popular local jazz ensemble The Treblemakers, with whom she recorded a CD, Itâs Not About The Coffee. Other CD credits include The Wedding Collection (Arista Records), Land of The Diamond Sun, A Wolf At My Door, The Same Road Twice (all on Melonball Records), Last Night At Europa, A Class Act, and Like Fine Wine (Canadian American/Caprice International/The Orchard). Commercial jingle credits include Barbie, Clorox, American Airlines, Keebler Cookies, Thomas' English Muffins, and many others. Original compositions used by international television and radio. Training: BM Jazz Studies, Indiana University, Bloomington, IN. IU studies include Vocal Training with Eileen Farrell and Tim Noble; Applied Flute with Harry Houdeshel; Jazz Studies with David Baker and Dominic Spera. Ongoing vocal studies with Douglas Susu-Mago, Chicago and Los Angeles. I am pretty easygoing, because I realize that students probably have a lot of homework, jobs, children to raise, etc. I believe that music should be enjoyable as well as educational! I also know that when a student practices, it heightens their enjoyment of music because it is far more fulfilling. I can guarantee that if you work with me as hard as I work with a student, you will feel excellent about your progress and ability! I have experience teaching people on the autism spectrum and those with Down Syndrome. Casio Privia, 88 keys. CD player, music stands. Bluetooth speaker. Awesome! I had a great lesson and took home some tools to help me find MY voice. Kris made me feel really comfortable and I'm looking forward to more lessons with her! Very satisfied! Everything is great! Definitely recommend! All ages, all levels, various styles including: Jazz, classical, contemporary/commercial music. Hello there! My name is Fernando, and I bring lots of profession playing and teaching experience to the table. I am an active musician in several local bands of various styles and genres, including jazz bands, Latin jazz bands, sax quartets, church groups, and musicals. I have played across southern California, several other states including Nevada (Reno Jazz Festival), Portugal, and Mexico. I have a Master of Music in Conducting from Messiah College, and a Bachelor of Arts degree in Music Education, from CSUF. I also hold a valid California Teaching Credential, which I completed through CSUF. I also hold an Associate of Arts degree in Music from Fullerton College. nstrumental and Choral Music Teacher at Buena Park Jr. High School, in the city of Buena Park, where I taught band, orchestra, percussion, and choir. I have also taught woodwinds for various high schools across southern California, as well as a marching/visual coach for marching bands. I front and lead my own Christian Contemporary Band. We've recorded two albums, of which I have composed the original music/lyrics, and produced both albums. We are currently working on our third album. I can teach everything from jazz, to classical, rock, blues, Latin genres (salsa, merengue, bolero, mambo, etc. ), and even contemporary Christian music in both English and Spanish. I mix all of these experiences and knowledge into a big melting pot, and apply it very efficiently and wisely so that my students can positively benefit from a wonderful and exciting real-world musical journey! I base my lessons around the student's needs for musical growth, and their own likes and dislikes. If there is something specific that the student wants to learn, as far as a style/genre or piece of music, I foster that and I help encourage musical growth and enjoyment around that. I am constantly encouraging my students to listen to as much music as possible, or better yet, to watch and listen to as much live music as possible. I strongly believe that this nurtures musical growth and serves as a role model. I am very patient and laid back, but I do expect the student to have fun while staying constant with individual practice. There is no substitution for perseverance, consistency, and hard work, but it doesn't mean that we will not have fun while we make music! An upright Yamaha acoustic piano is available, along with a Korg and Kurzweil digital keyboards, music stands, computer music software for studying repertoire (music), a large collection/library of books containing scales, exercises, music, etc. I also can make copies or print something for you if necessary. A sound system is available for listening to something is necessary. Flute, saxophone, and clarinet students must provide their own instrument, but I can point you in the right direction in terms of acquiring an instrument either for purchase or rental from a local music retail store. Students must provide their own instrument, except piano if student comes to my home for lessons. Student must also provide books (as assigned), and metronome for practicing at home. I can carry with me things such as: saxophone, clarinet, flute, a portable music stand, metronome/tunes, pencil, paper, and any other book(s) or materials as needed. I can teach classical, jazz/contemporary, funk, latin, blues, contemporary Christian, improvisation and music theory at very advanced levels. Fernando, is a very good piano instructor, he has the patience that students need. every lesson i learn a lot more about techniques and i can hear a differene in the sound i make and it is staritng to sound like music. My boys love learning from Fernando. He is very patient and explains things in an easy to understand way. They can't wait for their piano lesson next week. I've been playing the flute for over 25 years and teaching for 15. I teach beginning to advanced - age 5 to 99! Kimberly was born and raised in Tucson, Arizona. After starting the flute and piano at the age of 8, she knew she had found something she loved and wanted in her life forever. At age 12, she added the saxophone and clarinet to her repertoire of instruments. After completing her Bachelors degree in Flute Performance at the University of Arizona she moved to Los Angeles to work on her Masters degree at California Institute of the Arts (CalArts). There was where she fell in love with contemporary music and has devoted her life to sharing her love for it with others. After completing her Masters degree in Flute Performance at CalArts, she went on to pursue a Doctorate in Contemporary Flute Performance at the University of California, San Diego. Kimberly now resides in Los Angeles and plays with many groups throughout the city. All lessons are tailored to the students needs and goals. I like for all students to have serious music/etudes to work on as well as something fun that you enjoy playing. I teach everything from classical to pop music, beginner to advanced, age 4 to 99. Whatever your goals are, I can help you achieve them! I provide nothing, students must have instrument, books and music stand. Contemporary flute techniques and performance. Early childhood music and movement for young children. Kimberly has been teaching my 11 y/o saxophone for 2 years. She is patient and fun. My daughter enjoys the instrument so much more. I'm holding a doctoral degree from USC in flute performance. I teach students at all levels, focus on various of repertoires such as band music, orchestral music,solo flute music for ABRAM/CM test or competitions. C Thornton Wind Ensemble, Thornton Symphony Orchestra, Thornton Opera Orchestra and various chamber ensembles. Dr. Lu has worked with many renowned conductors such as James Judd, James Conlon, Carl St. Clair, Gerard Schwarz, H.Robert Reynolds, Sharon Lavery, Larry Livingston and Michael Powers. Chang has just had a concert leading the Thornton Baroque Sinfonia Ensemble performing a Telemann Flute Concerto. Dr.Lu graduated with a Doctoral of Musical Arts Degree from USC Thornton School of Music in flute performance studying with Jim Walker, former Los Angeles Philharmonic principal flutist. She also earned minor degrees in Music Theory, Orchestral Conducting and Early Music. Dr. Lu has been a successful teacher teaching at USC as an adjunct flute instructor as well as piano and music theory teaching at several music studios. Dr.Lu’s students have been awarded several prizes in national competitions, such as 1st prize in the SYMF competition in July 2016. As a teacher, I love to see my students take pride in their improvements and strive to be a leader. I have taught many students at all levels. From teaching them how to read music while providing the fundamentals of piano playing, to college level of auditioning for significant competitions. I particularly like to focus on students who are interested in band and orchestra at school. It’s the joy of teaching to see kids marvel at different tones and musicality they can produce. For all my lessons I include music theory and ask that students try their best to learn how music is connected and formed. Learning flute is a rewarding process, so please be patient and open-minded. Feel free to ask me any questions and I look forward to meeting you! We are super happy with the lessons. Our daughter (age 13) has rapidly advanced in her playing, and the teacher has the perfect mix of being gentle but firm in her expectations. Chang is a very dedicated and serious instructor. She is extremely passionate about teaching and learning; it shows in her students' growth. We are part of a group of teachers who try to encourage our students through public performance and actively participate in recitals every couple months. I highly recommend Chang if you are looking to try flute, whether it's for a school band, personal enjoyment, or lifelong goal. 10+ years of flute experience in NYC and LA! Rich has been teaching private lessons since 2010 and is currently available to teach lessons at your home and online. Rich has helped students from beginners to advanced improve their musical abilities and perform with confidence. Rich received his training at The Hartt School, The Juilliard School, and NYU where he received a degree in Music Education and Technology. As an expert in his field, Rich looks forward to helping new students achieve their goals. Rich's teaching style is inspiring, challenging, and fun. Rich is so skilled and friendly and punctual. My child had a fantastic lesson. Everyone has creative and musical abilities within, and it is the responsibility of the private instructor to bring those out in each student. For some people, learning an instrument comes very easily, and for others it is more of a challenge. Everyone learns differently, which is why private musical instruction is so crucial, no matter what the age of the student. A private instructor can customize learning opportunities so that the student can learn at his or her own pace, allowing the instructor to focus on each student's individual interests and passions. A private instructor can also provide customizedl feedback so that the student can improve upon weaker areas of playing and build upon strengths. rganizations where they learn to work toward common goals. It reinforces mathematical concepts when we talk about rhythm. It invites learning about history when we discuss famous composers, and physics when the way sound is produced is demonstrated. For adults, it keeps their minds active and always learning. No one is too old to learn to play an instrument! Adults learn quickly, and can have great progress in a relatively short amount of time. We work on basics: Tone Production, Breathing, Phrasing, Pitch etc. I offer 3 or 4 Times a year when we have a performance opportunity. Students work with a professional accompanist. I also offer the Certificate of Merit program through MTAC ( Music Teachers Association of California) which makes the students more well rounded musicians. I also have a Flute Choir - The Conejo Valley Flute Society - that students can be part of. I have been teaching over 40 years, and know that I can prevent bad habits before they begin! I offer lessons for any level, any age with an individual approach to each student, according to their needs and abilities. Before we begin, I'd just like to say - I have been giving Private Flute Lessons for more than 40 years, and feel that I can prevent bad habits before they begin!! Also that I teach at my Apartment in Thousand Oaks on most days, and also at my daughter's home in Agoura Hills on Wednesdays. Plus- I have several Reviews from former students that were sent to a different teaching site that I would be happy to share with you. I became a member of the Los Angeles Philharmonic at the age of 20 and played under the direction of more than 30 of the world's greatest conductors, as the current conductor was on leave! I have been giving private flute lessons since I was in High School, and College. I have a Bachelor of Music Education Degree from Drake University, School of Fine Arts. dio work (First Flute on "Dr. Zhivago"), and taught at Cal State LA, Pierce College, CSUN, and head of the Wind Department of the Southern Calif. Conservatory of Music for 30 years. I founded and still direct The Conejo Valley Flute Society (Flute Choir) in 2002- we are beginning our 16th season. I enjoy teaching all levels, all ages. I offer 3 or 4 Recitals a year, and am a member of MTAC (Music Teachers Association of Calif), National Flute Association, and Professional Musicians Local 47. I am head of the Wind Department for my local Branch Of MTAC (Conejo Valley), And I have been an adjudicator for the Certificate of Merit program for 15 years. I enjoy teaching and helping each student become the best they can be. Many of my students have held first chair positions, and some former students are now playing professionally! Let me share my passion for beautiful flute music with you! I've been playing flute and piccolo for over 20 years and love to share the gift of music to beginning flute learners. I have a minor in music from the Conservatory of Music at Biola University and studied flute under Gary Woodward. I have several years of experience teaching new to intermediate level students. Learning to read, play, and appreciate flute music is such a fun and inspiring hobby to share with you. As a flute teacher, I take pride in ensuring my students learn both appropriate technique and repertoire, and also the joy and passion that comes from playing the flute. I have 4 years of teaching experience with elementary through high school age students, and I have played flute and piccolo for over twenty years. I can teach students to read classical music and beginning music theory. 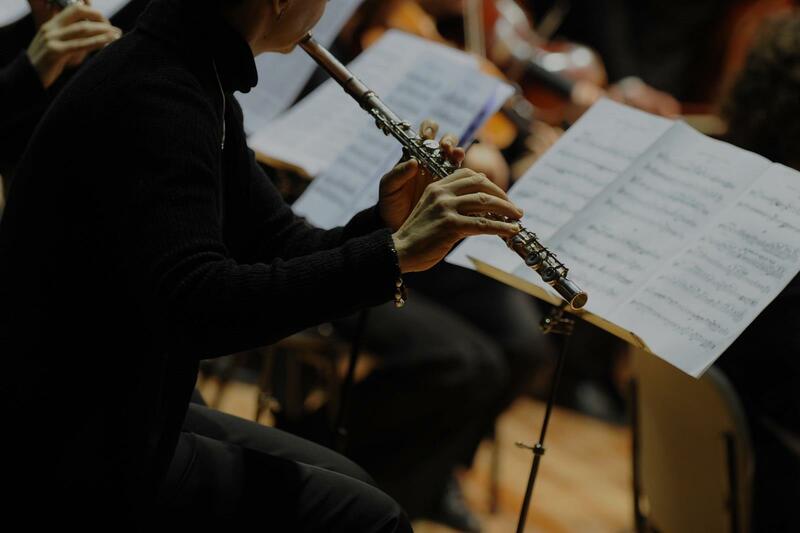 My students can expect to learn to play both solo classical flute repertoire, receive guidance for band and orchestra music, and play lots of duets! In addition to teaching great music and building the confidence that comes from playing an instrument, my favorite part of teaching is the relationships I get to build with my students. I believe that everyone is unique, which makes playing music with lots of people a great gift in this life. a music-loving family and began taking music lessons at a young age. I took private flute and piccolo lessons for thirteen years from the esteemed piccoloist Kathleen Dyer, and renowned flutist Gary Woodward in my studies at the Conservatory of Music at Biola University. After completing my BA in English Literature with a minor in music from Biola, I have taught private flute and piccolo lessons for 4 years. When I'm not playing gigs at weddings, galas, church services, or special events, I work in higher education and have been pursuing an MA at Talbot School of Theology. I can't wait to meet you, learn about your passion for music, and share the gift of playing the flute! Rachael was my first private instructor for flute and her teaching style and pace is phenomenal! She is very patient and is very knowledgeable about flute musicality and technicality. Would highly recommend to any aspiring flute players! Private flute lesson (possible to have classes in pairs with a sibling or a friend who is in the same level) for beginning or intermediate students by a professionally trained flutist who has over 16 years of flute playing experience. I'm a recent graduate from Berklee College of Music, one of the best contemporary music schools in the world. For beginners, we will start by getting to know your flute, practice breathing control, and have fun with music. For intermediate students, we will focus more on different flute techniques, sound quality, music theory, and performing. Students with special needs are welcome to sign up too. Let's have fun with music! Hi there, my name is Paris. I recently graduated from Berklee College of Music with a dual degree in Music Therapy and Songwriting, while focusing on flute performances as well. I also play piano, guitar, ukelele, percussion and I'm a singer-songwriter. I've worked with kids through music therapy services, and mentor programs, and I'm very patient with kids of all ages. I moved to the U.S. from China when I was 16. Being bilingual really helped me understand the beauty of different cultures and languages. I like to bridge the gap in all of my teaching experiences and my classes are open to anyone regardless of where you're from. atin, jazz, and musical, in symphonic wind ensembles, symphony orchestras, musical theater pit, and recording sessions. I also have been using piano and guitar to write songs and compose for school and for personal projects. Music has always been a crucial element of my life, so let's get on to this musical journey together! Can't find a teacher in Sherman Oaks, CA? The average cost of 60-minute flute lessons in Sherman Oaks is $70. While the exact cost will vary depending on the teacher, type of lesson, and your location, you should expect to spend anywhere between $70 and $70 per hour. For the best experience, we typically recommend 60-minute flute lessons. However, students looking for a more affordable option may want to consider a shorter lesson length of 45 or 30 minutes. On average, 45-minute flute lessons are 22% less expensive at $55, and 30-minute lessons cost 43% less at $40. Curious how much flute lessons cost in your area? Do a quick search to get local prices for the best flute teachers near Sherman Oaks. Students are raving about their Flute instructors on TakeLessons. Check out some of these recent reviews. "Sheila’s fantastic! My 12-year-old loves her and has learned a ton in just theee lessons. Highly recommend!" Los Angeles, CA teacher: Sheila M.
"She is helping me so much......."
Los Angeles, CA teacher: Kimberly K.
"She is understanding, and really instills not only musical skill, but a love an excitement for the instrument!" "We're making progress. Kim is very patient." "Kim is really good with new students, like me." Los Angeles, CA teacher: Cory B. "thank you so much for helping me understand the notes better and helping me make my notes more clear! es to get her started. Sheila really helped get her set up so she will be more confident when she starts music at school. We hope to take more classed from Sheila in the future." "Sheila helped my daughter improve her sound a lot from just the first lesson. They communicated great. Can't wait for the next lesson." Whether you're just starting out or a seasoned pro, check out the Flute articles on our blog.